In the past, Silicon Graphics didn’t sell containerized data centers — but the company that swallowed it and took its name nearly two years ago, Rackable Systems, did. And the new SGI is now taking its third stab at the idea. By making this simple change, the modules now take on more human proportions instead of looking like the guts of a submarine — and giving nerds claustrophobia. 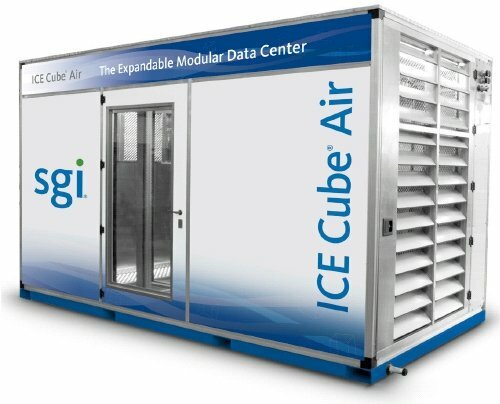 The ICE Cube Air containers, which SGI calls modular data center units, come in three sizes. The smallest is the 8-foot container shown, which has four industry standard IT racks. Up to four of the containers can be linked together to support up to sixteen racks of IT gear. Each module can have up to 148 kilowatts of input power; up to 35 kilowatts per rack are allowed. The medium container is a 20-footer that can hold up to 10 racks and can be clustered into four units for a total of 40 racks. This behemoth has a maximum input power of 371 kilowatts per module, with the same 35 kilowatts per rack as a max. So you’re talking about a maximum of 12,240 cores or 17.9PB of storage per 20-footer — and with four interlinked, that’s 48,960 cores or 71.7PB of disk capacity. The largest size uses a pair of 20-footer containers as a building module, and then interlinks up to four of these modules together to double up the capacity of those super-tall racks to 97,920 cores or 143.4PB of disk capacity in the whole shebang. The ICE Cube Air containers have a power-usage effectiveness (PUE) rating of 1.06, which is a little better than the Merlin modular data center that Capgemini announced in Swindon, England, in October, or that Yahoo! opened up a few months earlier with its chicken-coop data centers in Lockport, New York. PUE measures how efficient a data center design is, and is the ratio of the total power used by the data center divided by the total power supplied to the computing equipment. The typical data centre has a PUE of somewhere between 2 and 2.5, depending on whom you ask. Google says its best data centers run at around 1.10, and the company averages somewhere between 1.15 and 1.25. The ICE Cube Air containers have highly efficient fans and a three-stage evaporative cooling system that can be fed with a garden hose. You can also hook up chillers and only need to pump through about two gallons of chilled water per minute to cool an 8-foot module. This article was originally published at The Register.